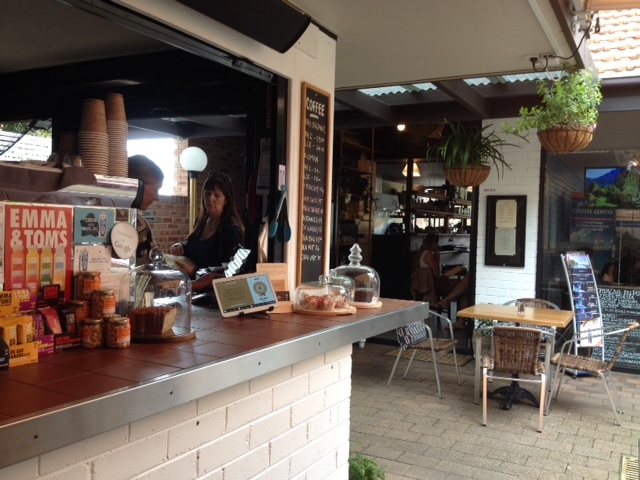 Living in Mosman I’m surrounded by cafes. 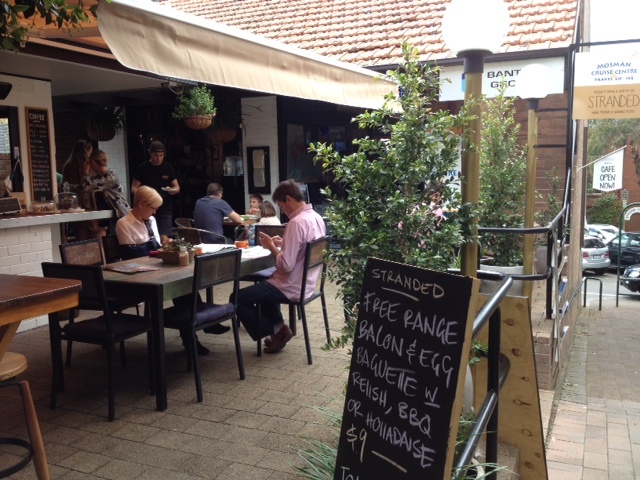 According to a recent article the suburb has more cafes than Bondi or Manly, with a search for the word ‘cafe’ in the Yellow Pages returning over 2,000 results for the Mosman area. The one downside of many local cafes is that they’re located alongside a road, sometimes a busy road. And when like me you have dogs in tow outdoor seating is the only option. Where is this taking me? To Stranded Gourmet Cafe – it’s hidden away down Strand Passage so you can sit in the cute covered courtyard without seeing or hearing a single car. 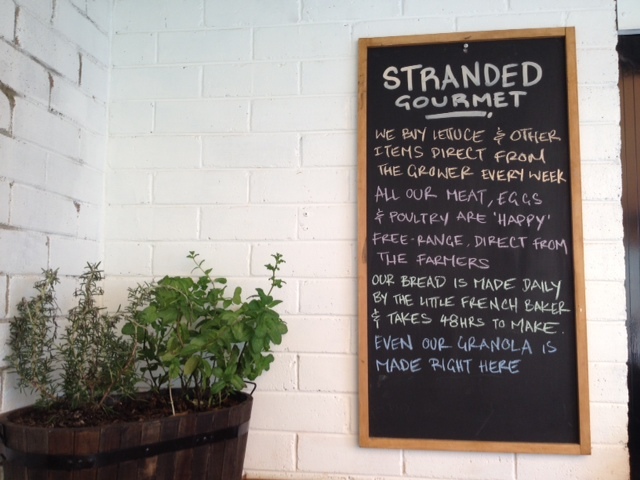 Brother and sister team Sam and Jemima Fellows opened Stranded Gourmet Cafe mid 2014. The cafe sits neatly with my feast wisely philosophy – with a menu that’s a relative short list of simple dishes made up of organic and local produce. And as it states on the menu all cakes, jams, slices and biscuits are made fresh daily by the Stranded team. Breakfast is served all day and includes everything from Stranded’s own house-made granola and crepes to more extravagant choices such as confit eggs. From midday you can also order from the lunch menu which includes various toasted sandwiches, salad and even pasta. Instead the sourdough bread comes from ‘The Little French Patisserie’ that’s located just a few doors down. The bread is so good my sourdough loving husband has even switched from Bourke Street Bakery. And the coffee? Stranded is one of only two venues in Australia to offer 100% wood-roasted coffee beans from Rome’s oldest coffee house. They also use organic coffee beans that travel just a short distance from one of my other favourite local spots – Bay Coffee Roasters. If you’re not after a coffee then note that they also stock Emma & Tom’s juices – they’re minimally processed, made with whole fruit and free from concentrates and added sugar. The salad is made from fresh seasonal market produce and in line with this it can change daily. 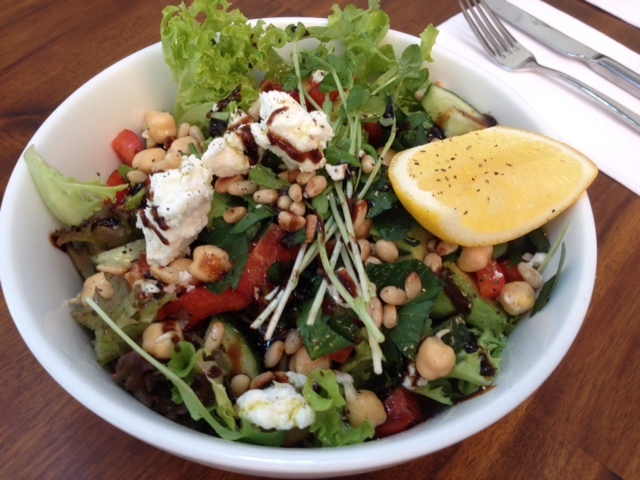 On the day of my visit the salad, a generous portion, had lots of ingredients including pine nuts, pepper, avocado, mixed leaves, tomatoes, chickpeas. For some this healthy salad might feel just a little bit too healthy. And that’s where my husband’s choice came in……. On the lunch menu you design your own toasted sandwich – made with your choice of fresh sourdough bread and choice of toppings. 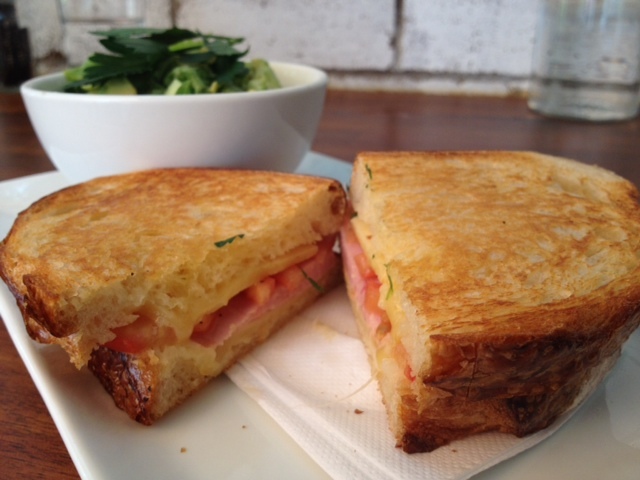 My husband opted for a classic ham, cheese and tomato – served on the amazing sourdough bread I mentioned earlier. What are the most popular menu items? When I asked Jemima this question she gave me several favourites – the Bahn Mi pork roll, the gourmet pies (vegetarian options available), the house-made banana and chocolate cake and the Stranded granola. It’s all so popular they even occasionally close the kitchen at early on Saturday because everything has sold. With future plans to open a couple of evenings a week Stranded Passage offers locals like me a great new spot to add to their cafe rotation. The quality produce and welcoming staff will definitely keep me going back. Tags: breakfast, cafe, coffee, Gourmet, lunch, mosman, Stranded. Bookmark the permalink.